As 75 members of the Citizens’ Assembly for Northern Ireland converged on the Europa Hotel on Friday 16 November for their second weekend, there was a real buzz in the room – members had clearly bonded over the first weekend and were now keen to get on with the task of translating what they’d learned into clear, useful and realistic recommendations for the future of social care for older people in Northern Ireland. To help members get back on-track, we shared a Weekend 2 Briefing Paper. 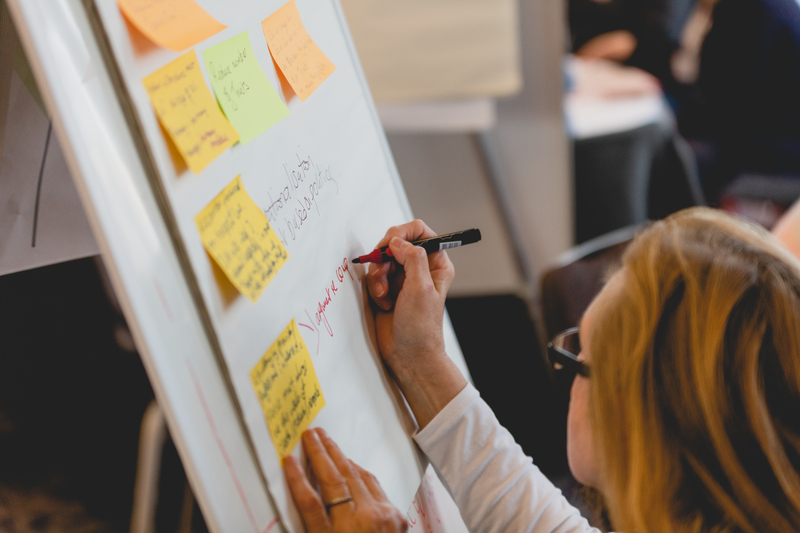 This drew out the cross-cutting themes that the Citizens’ Assembly members themselves had identified as the important issues to consider when they came back together again. Following a short presentation about how the process would work over the weekend, three short videos were played to inspire creative thinking about how social care for older people could be delivered differently – Older people and quality of life: better life in residential care, McAuley Place and Personalisation for older people. With that, the ‘business’ part of the first night was completed, and everyone settled in for a rather nice meal in the Europa Ballroom. When the members came back together on Saturday morning, we reminded them that this weekend was going to be very different to the last time the Citizens’ Assembly met. 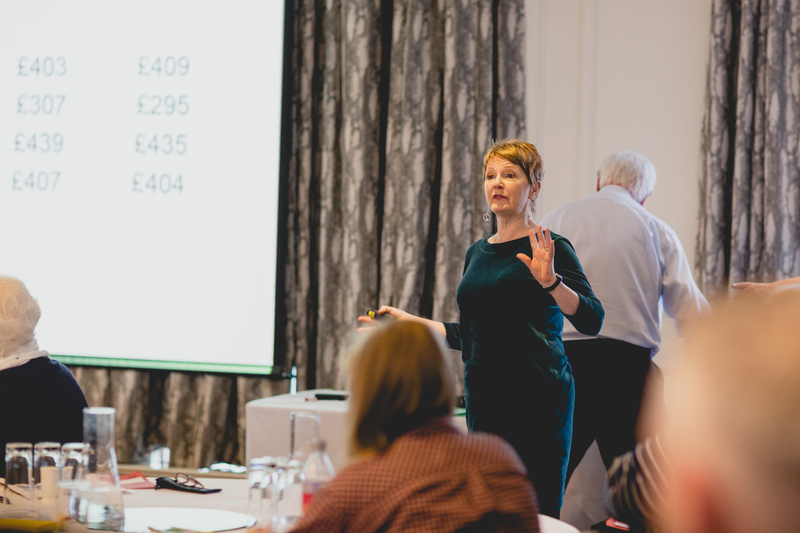 At the first weekend 12 guest speakers had presented differing perspectives on what was needed to improve social care provision for older people. This time it would only be the ‘core team’ – i.e. the lead facilitation team from Involve (responsible for ensuring an open and transparent process of deliberation and decision making) and the team of academic experts from Ulster University (there to provide an objective overview of the key issues and factual clarification for members) – who would be addressing the Citizens’ Assembly. Professor Ann Marie Gray (who’d been leading the academic team advising on content) kicked off the morning by presenting an overview of how social care is delivered in Northern Ireland, as a reminder to members of the wider context of their deliberations. This was followed by a presentation from Professor Derek Birrell, who gave more detail about how social care is funded in Northern Ireland, including comparative information from other parts of the UK, which had been requested by members at the end of the 1st weekend. Together these set the scene for moving on to the decision-making phase of the process. The third resolution acknowledged that, despite these being well-recognised issues among policy and decision-makers, there has been stagnation in moving forward due to a lack of cross-party strategic leadership above the constraints of the electoral cycle. After time had been given in small groups to discuss both the wording of the proposed resolutions, and their content, suggestions for re-wording were taken from the members in plenary. Each proposal for re-wording was either accepted, or rejected, by a show-of-hands vote within the room. Once a final wording had been agreed by the majority of members, each proposed resolution was put to a private paper ballot by the Citizens’ Assembly members. The results of this ballot can be found here. The principles that should underpin an efficient and sustainable system for the provision of social care to older people. In the next stage of weekend 2, following framing presentations from the academic team, the members were asked to consider how the values and principles they had identified might be realised in practice. Following these discussions members of the Citizens’ Assembly were asked to rank the relative importance of each of these sets of values and principles (in a private paper ballot) in preparation for developing more specific recommendations. Following this, and the announcement of the results of the prioritisation exercise on values and principles, each Citizens’ Assembly member was asked to choose one of the above three themes to concentrate on throughout the afternoon to develop ideas for recommendations. Approximately half the members chose to focus on ‘The system’, a quarter on ‘the care needs of individuals’ and a quarter on ‘care providers’. Working in these smaller, self-selected groups, members spent the Saturday afternoon in discussion and deliberation about the types of recommendations that should be put forward for a vote by the full Citizens’ Assembly on the Sunday. Overnight, the core team took the ideas for recommendations from each table discussion and consolidated them into 27 recommendations to present back to the Citizens’ Assembly on the Sunday morning. On Sunday morning recommendations made by their fellow Citizens’ Assembly members under the three areas of focus were presented back to the wider group. The first task was to agree the wording for each recommendation. To do this, a ‘traffic light’ system was introduced where each member of the Citizens’ Assembly had the opportunity to indicate whether they were happy with the each recommendation: either by ‘Green lighting’ that they were happy with the wording, ‘Amber lighting’ to indicate that they could ‘live with the wording’ or ‘Red lighting’ to identify that they wanted a significant change to wording. All ‘red light’ concerns were fed back to the core team for revision to the proposed recommendation. 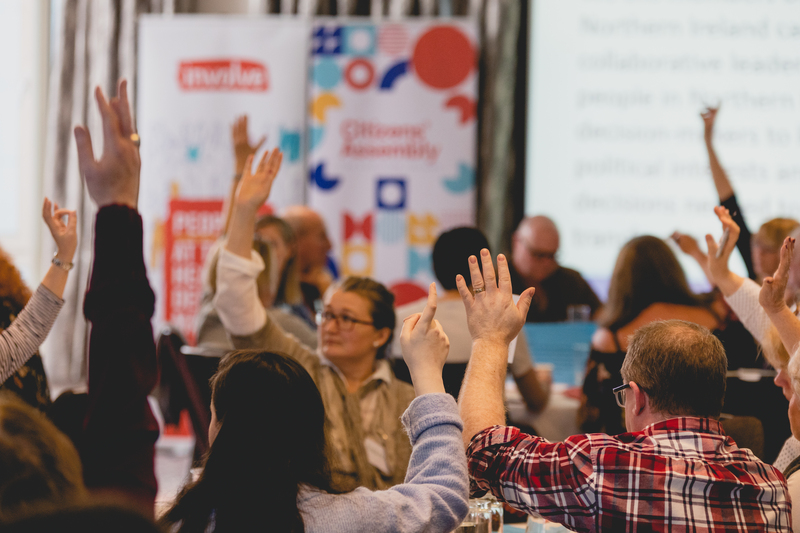 While this feedback was being processed the Citizens Assembly members had the chance to discuss the implications of the proposed recommendations, including any reasons they had for, or against, why the recommendation should be passed. Once we came back together as a whole group the propose revisions to wording were presented, and a show-of-hands vote endorsed or rejected any proposed changes to wording. The recommendations, subject to any revision agreed in the room, were then put to a private paper ballot of Citizens’ Assembly members. 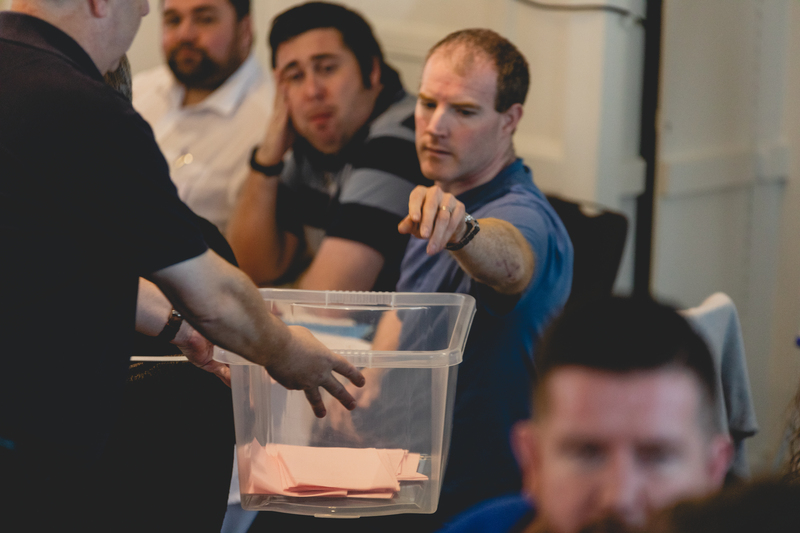 The raw results from the votes cast at the Citizens Assembly can be found here – but it will us take a while to analyse all the comments and nuanced reasoning behind these figures. To receive updates as they are published please sign up to the CA4NI newsletter. This blog post was originally published on the Citizens' Assembly for Northern Ireland website.